When I was in 10th grade, a star gazing session was arranged in my school. There was a low turnout, which I guess, was partly because it was in the early morning hours of the day at around 2 AM in winter, and maybe partly because, it wasn’t exciting enough. Nevertheless, for me it turned out to be one of the most unforgettable nights (rather days), as I saw several hundreds of things up in the sky. Some of them were shining, some of them twinkling, some were bright, others were faint, some of them moved across the sky with a steady glow of light – satellites. More importantly, a bothering question crept into my mind: “where on Earth (or above it) is the Moon? It was a new moon day. I vaguely remember the conversations we had that day regarding quite a few things like Moon cycles, how to differentiate between a planet and a star, and more. Several years later, I laid my hands on my first telescope (a 70mm refractor) in 2014, and soon enough I trained my new eye to the Moon in the sky. It was stunning. I could see the craters, the shadows cast by the mountains, the line dividing the day night region (the terminator). I was hooked on to it. I started observing the Moon in it’s different phases. In all my fascination for the magnificence and the beauty of our Moon, it never occured to me that ‘not seeing’ the Moon could be equally exhilarating. Yes, I am talking about the breathtaking sight of our Moon when it goes into hiding – A Lunar Eclipse! Here I’ll try to take you on learning journey in understanding a lunar eclipse, and questions surrounding it. Our Moon, along with all the other stars, appears to drift slowly across the sky. The apparent motion of the Moon in the sky (as we see it) is due to a combination of rotation of our Earth on its own axis, and revolution of Moon around the Earth. The Moon is actually cruising at nearly thrice the speed of sound around the Earth (at 3683 kmph). At this speed it takes about 27 days to complete one orbit. As the Moon orbits the Earth, and Earth together with the Moon orbits the Sun, there are few nights/days where these three celestial bodies align themselves up in a straight line. Whenever this occurs, we have eclipses. 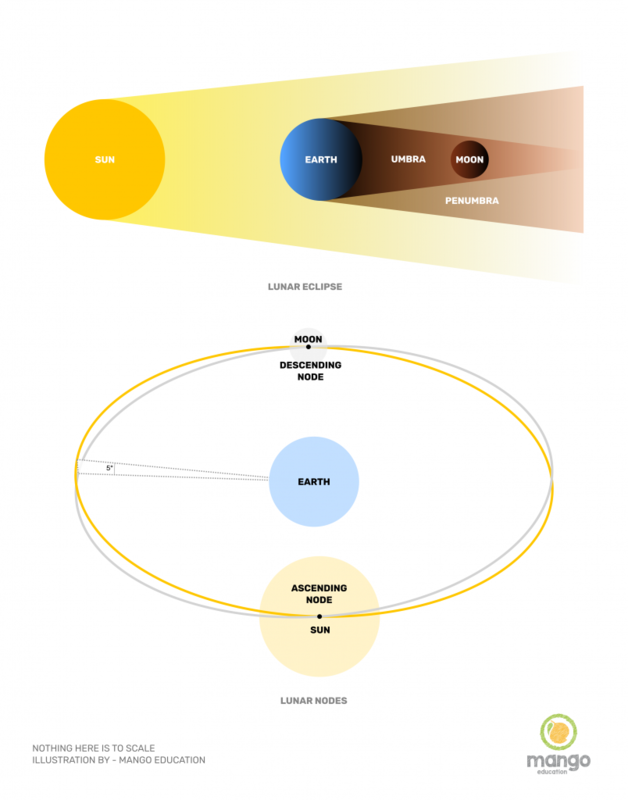 In its orbit around the Earth, when the Moon is at an opposition (opposite to side of the Sun from the Earth’s perspective), that is, on a full Moon, if the Sun, Earth, and the Moon are aligned in a straight line, then the sunlight as it travels towards the Moon is blocked by the presence of Earth in its path, and hence a shadow is cast on the Moon. The Moon darkens as it enters the penumbral shadow (the region of shadow where sunlight isn’t completely blocked, but the intensity is reduced) and slowly begins to hide in the umbral shadow (region of shadow where sunlight is blocked totally), until it is completely hidden from our view – a phase called totality! Why don’t we have eclipses every month? But with Moon passing in front of the Sun every month (new moon), and also passing on the opposite side of Sun every month (full Moon), why don’t we have eclipses every month? That is to say, every new moon should be a solar eclipse (Sun being eclipsed by the presence of Moon in front of it), and every full Moon should be a lunar eclipse (Moon being eclipsed as shadow of Earth falls onto the Moon). Let’s see! Imagine the earth as it orbits the sun, sweeps out huge arc around the sun, and in one year it would have made one full 360 degree arc – a circle. Let us call this the orbital plane of the earth (also called the ecliptic). Now, the moon’s orbit around the earth is tilted with respect to this imaginary orbital plane, by about 5 degrees. So, as the moon orbits the earth it doesn’t move always touching this plane, it intersects the plane only twice, those being called the lunar nodes, once when moving up into the earth’s orbital plane called the ascending node, and once while moving down into the earth’s orbital plane, called the descending node. With such a tilt inherent in its orbit, it is rare for all these three bodies to align in a straight line. The Moon, for most of the times, misses entering the shadow cast by Earth by going above or below it (as in a lunar eclipse) or the Moon goes above or the below the Sun failing to cast a shadow on the Earth (as in a solar eclipse where Moon exactly falls in front of the Sun). So, only when there is a full moon or a new moon coinciding with the moon being at the lunar nodes, the sun, the earth and the moon can align in a straight line and the eclipses occur. This is reason why we don’t have eclipses every month. What is special about the lunar eclipse on July 27, 2018? It is the longest eclipse in the century, the umbral eclipse lasting for 1 hour and 43 minutes. The previous eclipse on Jan 31st, 2018 lasted for about 1 hour and 16 minutes. The shortest lunar eclipse in the history was for only about 5 minutes. The reason why duration of the eclipses differ is because the shadow cast by earth takes up the shape of a cone when sun shines from behind it. The moon doesn’t always pass through the same regions of the cone. When it’s passing right in the middle, the moon is under the shadow for a much longer time than, for example, when it is just within the outer surface of the cone, where it will exit the cone sooner. This eclipse occurs when the Moon is at apogee, that is, when the Moon is the farthest from the Earth. The Moon would appear a little smaller than usual. And also this is another, but less prominent, reasons why the eclipse is lasting longer. Since the Moon is far away, the orbital speed is little lesser than usual, and so it takes a little longer to exit the shadow of Earth. And also, on the same day we have another celestial event – Mars opposition. This is the position when Mars is exactly on the opposite side of the Sun from Earth’s point of view, and is also the closest it gets to Earth. So it appears the brightest as seen from Earth at opposition. In fact the Mars will be closest to Earth since 2003. It’s also fantastic when you realise 4 celestial objects (Sun, Earth, Moon and Mars) are lined up together, unlike other lunar eclipses where only Earth, Sun, and Moon line up! You can expect to see Mars very close to Moon in the sky on the day of the eclipse! When the Moon is completely under the umbral shadow, that is, in totality phase, it starts glowing in reddish orange colour. A stunning view. The reason behind this is refraction and scattering of sunlight, happening at a planetary scale. As the sunlight passes through the Earth’s atmosphere, it is refracted, and shorter and more energetic wavelengths like blue, green and others are scattered, while longer and less energetic wavelengths like red and orange make their way through on the other side of the atmosphere and fall on the Moon. The Moon is merely reflecting what’s falling on it. That’s why it’s reddish, and hence the name blood moon. Is it safe to see this eclipse? Absolutely safe. What you see is just a shadow falling on the Moon. There is nothing more than that. In fact Moon is going to appear fainter as the intensity of sunlight reflected off the Moon is reduced than usual during the eclipse. This is a celestial spectacle that should not be missed at all. Is it possible to see the eclipse from India? The July 27 blood moon will be visible in India for its entire duration. A total of 6 hours and 14 minutes. I hope now you have a reasonable understanding of a lunar eclipse, but there is still a lot that could be discussed. Like, for example, apart from the visual treat to our eyes, does an eclipse offer us to study any sciences? What do we know about the moon yet? Has an eclipse revealed some characteristics of the moon which otherwise we wouldn’t have noticed? And more such questions. The early morning hours on that day in my school nearly 15 years ago, a seed of curiosity for the cosmos was sown in my mind, and it’s been growing ever since! My fascination for the moon, and the entire cosmos, is still fresh and they never cease to amaze me. An eclipse of the moon reveals the otherwise unseen and otherworldly beauty of nature! Thus my learning journey began, and I hope this eclipse triggers a sense of wonder in you, and puts you on a learning journey into the cosmos. What kids learn and think now is good enough?